What is ATI CrossFire and how does it work? 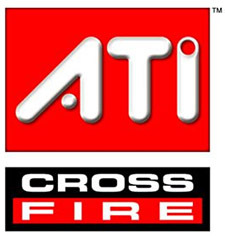 2005 saw the introduction of ATI CrossFire technology, which works similar to NVIDIA's SLI. Just like SLI, CrossFire uses multiple Graphics Processing Units (GPUs) to improve 3D graphics performance. In this article we take a look at the different generations of CrossFire and the different modes of this great technology. When ATI CrossFire first came out it worked like this: You needed a CrossFire compatible motherboard, a 'master' CrossFire Edition video card, and another regular 'slave' video card. The master video card contains a compositing engine that combines the two GPU outputs and displays it to the screen. The master and slave video cards did not have to be the same, but they must be of the same GPU family. The two video cards are connected together via a Y-dongle which connects into each card's DVI port. The next generation of CrossFire did not require a master card. You just needed two PCI-Express video cards with CrossFire capability, and the dongle connection that was present in the first generation was removed and a bridge was used to connect the two video cards (similar to NVIDIA SLI). Part of the AMD spider platform is the recently released CrossFireX which allows you to connect four video cards for fast gaming performance. ATI CrossFire can be set to function in different modes. Alternate Frame Rendering - Just like with SLI's Alternate Frame Rendering mode, each frame is rendered by each GPU one after the other. For example, the first GPU will render all the even frames while the second GPU will render all the odd frames. Supertiling Mode - Supertiling works by dividing the screen/frame into small squares of pixels and spreading them evenly to each GPU for processing. Scissor Mode - In scissor mode the frame is split up into two pieces, depending on rendering effort. The two GPUs are given each half of the frame for processing. Antialiasing - Same as the SLI antialiasing mode, this increases the quality of the image instead of the rendering speed. You can enable up to 14x of antialiasing. Return to How To Choose A Video Card from ATI CrossFire Explained.